A healthy hamster needs stimulation and exercise, and a hamster wheel or spinner provides both. With so many options on the market, how do you choose one that’s right for your hammy? We’ve done extensive research on the topic to bring you the answer. Hamsters need exercise wheels to burn off their abundant nightly energy. A wild hamster can travel six miles every night. Having a wheel in your hammy’s enclosure lets them get that mileage without actually going anywhere. How do you decide between a hamster wheel or another pick, such as a spinner or flying saucer? Do certain hamster species need specific wheels? Read on, as we’ll answer those questions and more, including what to do when afflicted with the annoying squeaky hamster wheel. Unlike us people, who prefer to be active during the day and sleep at night, hamsters are a little different. They’re nocturnal and crepuscular. Their most active times are at night, which they spend awake. 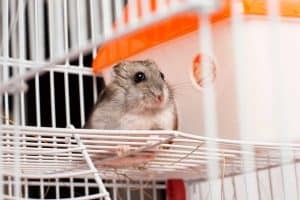 Read more: Should You Cover Your Hamster’s Cage at Night? Once you go to sleep, your hamster will start moving. In the wild, hamsters can cover a lot of ground in a single night. They’re capable of going at least six miles. During this time, they’re foraging for food to bring back to their burrows. While your pet hammy has no need to forage, they still have to do something. Their urge at night is to run. By providing them with a wheel, they can run to their heart’s content. They get the exercise they need without having to run real miles around your house. 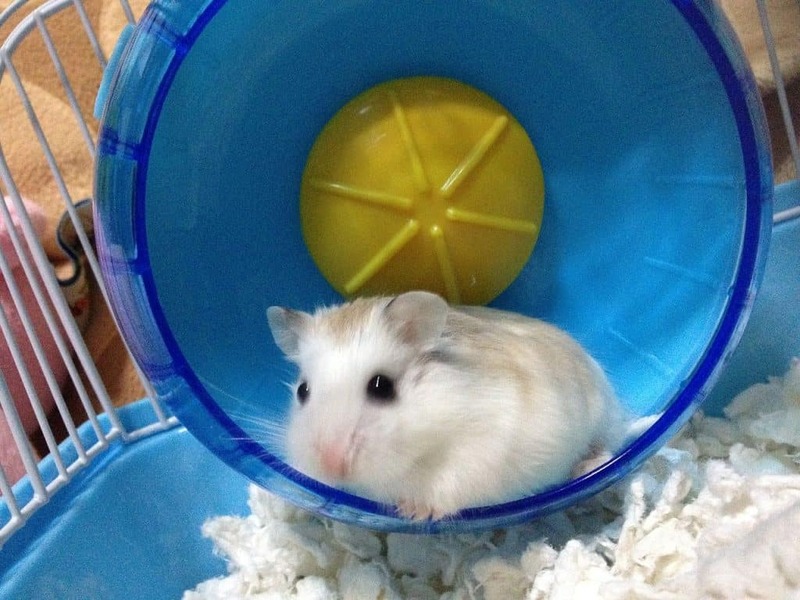 Depriving your hamster of a wheel can be detrimental to their health in several ways. Failing to get adequate exercise could lead to weight gain in your pet. That often brings on a whole host of other health issues. Far worse is the paralysis that can develop. Without enough regular activity, hamsters can become partially paralyzed. You’ll know yours cannot move if their hind legs seem stiff and they’re often hunched over. Luckily, this paralysis is not permanent, at least not if you rectify the issue quickly enough. 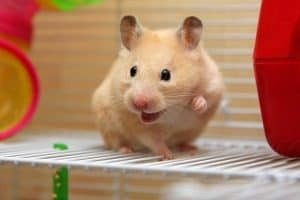 Once your hamster can run, their limbs and posture will improve. With time, they’ll be back to normal. Now that you know why your hammy needs a wheel, you’re one step closer to picking out the right one. Here are several types you might consider. The first type is the good, old-fashioned hamster wheel. Wheels can be made of a slew of materials, but the most common are metal and plastic. The wheel can be installed in the cage via an external attachment or placed inside the cage. The external attachment wheels may seem advantageous, but they aren’t always. Lack of ventilation is the biggest problem, as poor hammy can overheat. Not only that, but external attachment wheels are notoriously a pain to clean. You’d either have to use small cleaning brushes (intended for baby bottles) to scour the various components of the wheel or take the whole cage apart and clean it that way. 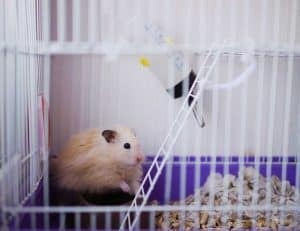 By placing a wheel in the hamster’s cage, you’re saving yourself a lot of future time and effort. However, you must ensure the placement is ideal. Never set up a wheel on an uneven surface. Keep the area clear of bedding, as the bedding can get caught in the wheel and stop it from working. You also want to make sure the wheel won’t collide with the sides of the cage, creating friction and possibly injuring your hamster. What size should your hamster wheel be? Since they’re so common, hamster wheels are available in every size imaginable. The size of your hamster will determine which wheel is best. For instance, 6.5-inch wheels or smaller are recommended for “robos”, winter whites, and other dwarf hamsters. If you have a Syrian hamster, you’ll need a bigger wheel that’s at least eight inches. You should also take the width of your hamster into account as you choose a wheel. Since hammy needs to fit in the wheel and run, it’s important that the wheel is wider than your pet. A wheel that’s too wide can be awkward to use and one that’s not wide enough could cause injuries. Speaking of hamster injuries, we want to caution you from getting a wheel with metal rungs. It’s okay if the back part of the wheel has rungs that attach in the center. The area where hammy runs should not have any rungs, though. It’s too easy for your hamster to injure themselves. One misstep and their foot can fall through the rungs. That could lead to a broken foot. It’s also not unheard of for spinal injuries to occur if the tail gets caught between the rungs. Another option is the flying saucer. No, this is not like the amusement park ride. It’s more of a combination of a hamster ball and a wheel. A flying saucer stands on two legs attached to a base. Sitting in that base is a bowl. Your hamster goes in the bowl and runs. There are tiny grippers throughout the bowl to prevent slipping. Most flying saucers are made of plastic, and they come in some pretty fun colors, too. Like a hamster wheel, you can select from several sizes to match your hammy’s size. Small saucers are ideal for dwarf breeds, while medium or large saucers can accommodate bigger species. Since the bowl is one solid piece, the risk of hamster injury is reduced. That said, you must make sure the saucer stays dry, as it can be slick if wet. If you’ve had your hamster for a while and you want to give them a different experience, a flying saucer is a great choice. Finally, you might choose a spinner for your hamster. This is a simplified version of the wheel. The circular base where hammy runs is one solid piece, often plastic. There are no rungs so there’s no risk of injury. Hamster spinners can be placed in the cage and sometimes installed to the wall. Like wheels and flying saucers, there are several spinner sizes to choose from. These may be as small as a 4.5-inch diameter for tiny species to 12 inches for larger hamsters. The main benefit of spinners over wheels is that they’re built to be quiet. If your hamster often keeps you awake at night with all that running, then get them a hamster spinner. They’ll appreciate it and so will you. 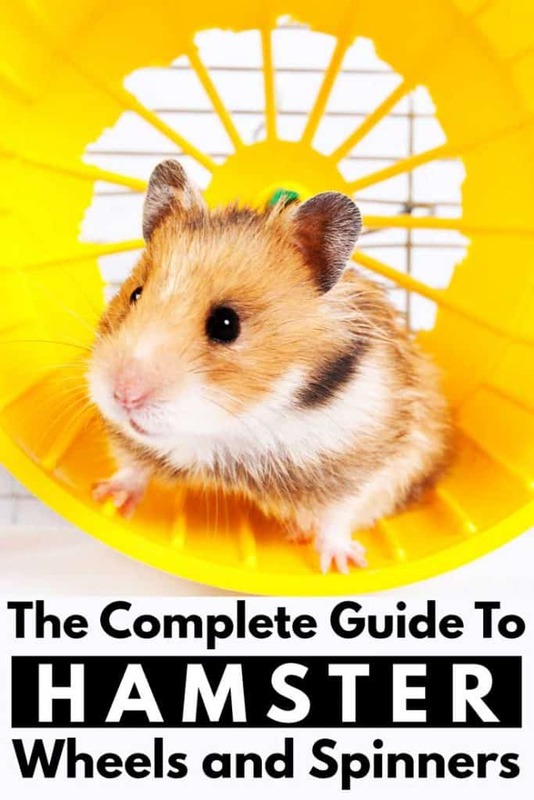 While this is a guide on hamster wheels, we did want to mention hamster balls at least once. If you’re still awake when your hamster is at their most active and you want to give them a change of pace, a hamster ball is a nice means of exercise. That said, there are limits to its use. It’s possible for your hamster to overheat and become dehydrated if you leave them in the ball too long. Yes, this is the case even if the ball has air holes. The ventilation is minimal no matter the design. That’s why it’s recommended you keep these play sessions to 30 minutes or fewer. Also, you should only let your hamster roll around in a ball if it remains on flat ground. Hard flooring or carpeting is best. There should be no ledges or areas where hammy could fall off. For their safety, you might want to keep other pets out of the room while your hamster is in its ball. Do Wheel Needs Vary by Hamster Species? Indeed, wheel needs do depend on the species of hamster you have. A tiny dwarf hamster doesn’t need a wide, large wheel. If you give them one though, they’ll probably still try to use it. This can be problematic in several ways. First, your small pet might have a hard time climbing onto the wheel. If it’s too big, spinning the wheel might be difficult, which could leave the hamster prone to falling if they can’t spin fast enough. Even if they can move the wheel, they could overexert themselves and become dehydrated or sick. Injuries are also likely. A big hamster with a too-small wheel will also run into difficulties. The wheel likely can’t support their weight, so it’s not safe to use. It could break mid-run, which could again injure your poor hammy. It’s always best to buy a smaller wheel for a smaller breed of hamster. The bigger the species, the wider and larger a wheel you need. The following list of flying saucers, spinners, and wheels comes courtesy of Amazon. These products are all highly-rated, so they should be safe for your hammy to use and enjoy. As always, make sure you get a wheel that’s wide and large enough to accommodate your hamster. Our first pick is the flying saucer from Ware Manufacturing. An inexpensive addition to any enclosure, this saucer is made entirely of plastic. It has curved grips throughout so your hamster can run safely and freely. There’s no need to worry about feet and tail pinching here! This saucer has a width of 7.25 inches and is available in a medium size. Smaller and mid-sized species of hamsters should be able to use it just fine. If you have a bigger hamster, you might want to look for a different flying saucer. If you prefer a silent home, the Kaytee CritterTrail Snap-On Comfort Wheel will keep it that way. Available in a single size, this wheel has a width of 4.5 inches and a diameter of 6.75 inches. Like most hamster wheels, Kaytee’s is made of durable plastic. The base of the wheel is purple and the enclosed parts are magenta. That pink plastic is translucent so you can see hammy as they run around excitedly for hours. They’ll so do comfortably too with plastic grippers inside the wheel. This snap-on wheel installs quickly and easily, with very little effort required on your part. It’s even universally connectible according to the manufacturer. The Silent Runner from Exotic Nutrition is an encased plastic spinner with four openings. It measures nine inches, so mid-sized and large hamsters are the best choice. The inner track is three inches wide and the spinner itself is 11 inches tall. With included ball bearings, Exotic Nutrition’s wheel is designed to be quiet no matter how hard your hamster runs. It also lacks a center axle. This significantly reduces the chances of your hammy getting their fur stuck or suffering a spinal injury from a caught tail. The walls inside the spinner are black and include textured tracks. The Silent Runner should be installed in the cage, so it does not have a base. All cage attachment tools are included. Another great spinner option comes from Qin ChenChen. This is an inexpensive pick that has a diameter of 8.4 inches. Mid-sized and bigger hammies will fit on this colorful plastic wheel just fine. You can install this spinner to the cage if you prefer. You can also use its wire base to stand it up. The ball bearings, like the Silent Spinner, promise quieter operation. The wheel itself is made of plastic with an interior grip to avoid slipping. The adorably-named Wodent Wheel from Transoniq is intended for all sorts of rodents, including hamsters. It’s semi-enclosed to prevent your hammy from falling out. They’ll also feel safer running with the plastic sides. There are five large entry holes for your hamster to crawl into and out of. The wheel itself measures eight inches, so it’s a good pick for most mid-sized hamsters. There’s no risk of strangulation, even with the wheel being enclosed. Inside, the plastic wheel has grips for safer use while enjoying a run. Since hamsters are nocturnal and crepuscular, it’s not recommended you keep yours in the bedroom. Their little feet pitter-pattering on their wheel all night will prevent you from getting quality sleep. Even if your hamster cage is elsewhere in the house, if hammy’s wheel is squeaking, you might be able to hear it. Not only is the squeaking totally annoying, but it could signal something is wrong with the wheel. Letting your hamster continue to run on a squeaky wheel is not advised. Most of the time, it’s metal wheels that squeak, but plastic ones can, too. A lack of lubrication is to blame. By lubing up the components at the back of the wheel, you can quickly solve most instances of squeaking. Now, we must caution you to only use sunflower or almond oil for lubrication. Your hamster will likely get curious as you work to de-squeak their wheel. They could start licking at the substance. The above oils won’t cause them any harm, but any other lubricants will. Pet owners at Hamster Central recommend using a cotton bud to dab the sunflower oil on sparingly. Just dumping it on the back of the wheel is practically inviting your hamster to have a snack. They could also rub their body against the greased-up wheel and end up covered in sunflower oil. Once you’ve applied the lubricant, listen up when your hamster starts running that night. If all is quiet, then you’ve solved the problem. If the wheel is still squeaking, you might try more sunflower oil. If that still doesn’t work, then it might be worth it to buy hammy a new wheel. Get into the habit of cleaning the wheel when you clean your hamster’s cage. If you notice droppings or other messes on the cage one day, don’t leave these to sit. They’ll harden and make an even bigger mess of things. When the wheel is especially dirty, you can typically soak it in hot water for 15 or 20 minutes. Do keep in mind that getting a metal wheel wet could lead to rust or corrosion. It’s not recommended you use stronger cleaning products than antibacterial disinfectant or dish soap. You’ll probably have to detach and disassemble the wheel to get it truly clean. Using toothbrushes, cotton swabs, or a sponge can get into the tiny crevices, nooks, and crannies that your fingers can’t reach. If you have a plastic hamster wheel, spinner, or flying saucer, inspect it regularly for cracks. Even a small crack necessitates throwing the wheel away and getting a new one. Cracks can spread fast. You wouldn’t want the wheel to crack when your hammy was using it! Make sure the wheel is completely dry and free of any cleaner residue before putting it back in your hamster’s cage. They can get sick if they lick at the cage and there are bits of soap or disinfectant on there. Also, as mentioned, a slick wheel can be dangerous to use. Whether it’s a traditional wheel, a spinner, or a flying saucer, your hamster needs something to exercise on at night. This satiates their urge to run and wards off health problems, including paralysis. The wheel should be wide and large enough for your species of hamster. Cleaning the wheel weekly (sometimes more regularly) is necessary, as is lubricating it. That will keep those annoying squeaks at bay. Good luck! Where Should I Put My Hamster’s Cage?